Faith alone makes us Christians, but confession alone marks us as Christians. We are confessional. We confess the faith once and for all delivered to the saints. We confess the three catholic (universal) creeds of Christendom: the Apostles’ Creed, the Nicene Creed, and the Athanasian Creed. 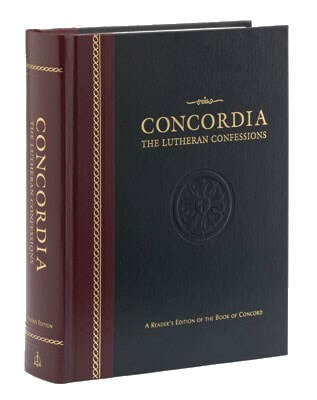 We confess the Lutheran Confessions, collected in the Book of Concord of 1580, as true expositions of the Holy Scriptures. These confessions teach the teaching of the Bible. They are: The Augsburg Confession, the Apology of the Augsburg Confession, the Smalcald Articles, the Treatise on the Power and Primacy of the Pope, Luther’s Small Catechism, Luther’s Large Catechism, and the Formula of Concord. These are not dusty old relics of a lost past. They confess the true faith of the true church throughout the ages. They speak God’s word to the church and to the world. They confess God’s eternal truth and reject false teachings that threaten the souls of Christ’s sheep. All Lutherans are taught the Small Catechism.